Fire is a natural process. Fire has helped shape our wild lands for thousands of years and is important for the survival of many plants and animals. 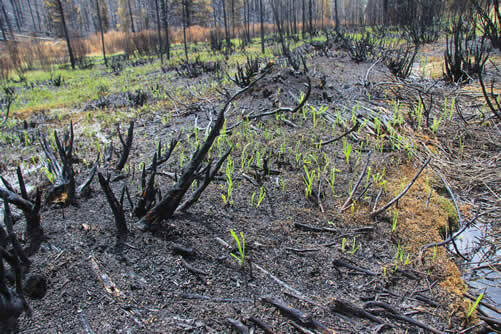 Fire reduces accumulation of vegetation that can inhibit plant growth. Periodic fire stimulates growth, increases reproduction of plants, and regenerates wildlife habitat. When we integrate structures and other human development into the natural environment, we are creating a wildland/urban interface (WUI) condition. This increases the necessity for fire suppression due to higher values at risks and essentially stops the natural regeneration process of the forest. Pre-settlement, fire was an essential tool widely used by Native Americans. It was part of their everyday life. Fires were purposely set for many reasons all critical for their survival: providing food, places to live, safety, and in warfare. Post-settlement, fire has been excluded from the landscape with often disastrous results. In most cases, large fires occur during periods of hot, dry weather combined with a buildup of vegetation in the forest. When wildfires do not frequently burn in the forest, the vegetation increases and provides more fuel for larger fires. More fuel means more opportunity for fire, which in turn creates large wildfires which spread quickly and are difficult to suppress. One way to decrease the threat of extreme fire on your property is to thin your trees and eliminate brush. Thinning your property removes overcrowded trees and cleans up dense brush on the forest floor creating not only a lower fire risk area but also promotes forest health by eliminating competition for sunlight, water, and nutrients among remaining trees. Thinning projects mimic the objectives of naturally occurring fire. More people than ever before are moving into rural America. This development is creating more Wildland Urban Interface zones. Wildland Urban Interface, (WUI) is commonly described as the zone where structures and other human development meet and intermingle with undeveloped wildland or vegetative fuels. This WUI zone poses tremendous risks to life, property and infrastructure in associated communities and is one of the most dangerous and complicated situations firefighters face. Homes are simply an additional type of fuel for fires – urban fuel. You don’t have to be miles away from the city or lacking neighbors to be in the WUI; you may be right in the middle of a city and still have WUI fire concerns. Remember, the WUI is not a location, but rather a set of conditions. Reducing hazardous fuel loads within the WUI will reduce the fire effects during a wildland fire event. 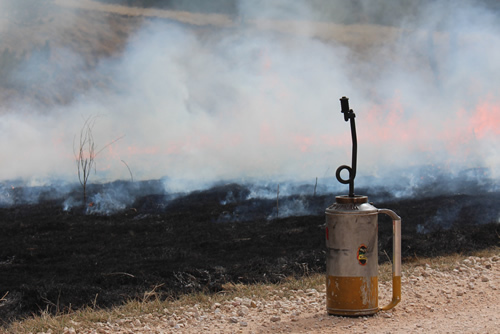 A well maintained WUI environment will provide a safer area for fire suppression crews to operate. This will allow suppression efforts to be more effective in managing the wildfire. Wildland fires are usually fast moving events and the effects on a local area will happen very quickly. Preparing in advance of a fire will dramatically reduce your risk from wild fire. Suppression resources are more effective if people have done their part and are prepared for a wildland fire. Now is the time to take action, not when smoke is in the air. Survivable space is an area around your home in which the fuels – such as trees, grass, and brush – have been modified or eliminated to reduce the intensity of a wildfire or stop the spread all together. Survivable space aims to create properties better able to withstand a wildfire without intervention and direct protection provided by firefighting forces. During a significant wildfire, it is likely that there may not be adequate firefighting resources available to have a fire truck in every driveway or conditions may not allow for protection of all homes. Access is an important consideration for emergency response whether it is fire, ambulance, or law enforcement vehicles. All of these agencies may be responding into an incident area. Another consideration would be the public evacuating during a wildfire incident while emergency service personnel are responding into the area. Properly planned access routes would provide for increased safety and efficiency. Primary access roads should be built to county specifications. Design loads for bridges longer than 200 feet located within a driveway should be rated to support the maximum weight of the responding apparatus. Primary ingress/egress roads should be buffered out to 180 feet on either side; with the last 30-feet tapering into a natural forest habitat creating a shaded fuel break. These shaded fuel breaks provide a more pleasing aesthetic appearance because the treatments do not end abruptly at the edge of the treatment area. The forested areas of these travel corridors need to be managed in such a manner that will minimize the chances of a catastrophic crown fire threatening the use of these travel routes during a fire event. If the 180 foot buffer cannot be achieved the entire road right-of-way should be treated. Ladder fuels and timber litter should be greatly reduced or eliminated within these fuel breaks to reduce fire intensity. Conifer canopy separation of approximately 30 feet between individual crowns is desirable with small clusters of trees allowable to create diversity. These fuel breaks will also provide fire crews opportunities to conduct tactical suppression activities and possibly reduce spread of a wildfire. Also critically important in an emergency is signing. Address s numbers should be large enough to be seen clearly from the road, day or night, from either direction a vehicle may approach. Ensure numbers are in a color contrasting the background, in good condition, and not covered by vegetation. Zone 1 is located from your home out to 30 feet. Plants should be fire resistant, low growing, well watered, and spaced at least 3ft from the home. There should be very few trees in this zone. Trees within this zone should be well-spaced from each other and your home. Brush, shrubs, and other plants should also be removed or generously spaced to prevent fire spread to your home. Zone 2 is between 30 and 100 feet from your home. Trees in this zone are spaced so the fire will not carry in the canopy. Surface vegetation (ladder fuel) should be spaced to keep the fire from spreading from the ground to the trees. In this zone, a few maintained decorative juniper and cedar bushes may be left or planted as long as they will not impact surrounding vegetation if ignited. Firewood piles and propane tanks should also be located in this zone to protect your home. Zone 3 is 100 to 300 feet from your home or to the edge of your property if neighbors are close. Trees are spaced similar to those in zone 2. Your neighbor’s property may be in this zone directly affecting your homes ability to survive so coordination is important. Neighboring homes may also fall within this zone and pose a direct threat to the survivability of your home. Work with neighbors to ensure a community wide approach is in place. The roof is the most vulnerable part of your home and outbuildings during a wildfire. Embers can ignite the roof covering, other roof components, and debris on the roof. The complexity of the roof’s shape also influences the potential for ignition. A roof with valleys and roof/wall intersections where combustible debris such as leaves and needles can collect has more potential for ignition than a simple roof. Even if you have a fire resistant roof, the piles of combustible debris in these areas may ignite the siding material, which in many cases is also combustible. A roof assembly is the complete roofing system of interacting roof components including the roof deck, insulation, and the roof covering such as shingles, tiles, panels, or membrane. The probability that a home will survive a wildfire is greatly influenced by the components of the roof assembly. You roofing material may be fire rated but if the fire burns underneath the fire resistant covering into a combustible material it will spread quickly into the interior of your home. Pine needles may burn in a gutter, igniting the wood fascia board which will ignite the roof decking, compromising your home. Having not only having a rated roof but a rated roof assembly decreases structural ignition potential by reducing the presence of flammable materials exposed to embers. Recommended roof assembly materials are rated Class A (highest rating), or Class B. Although Class B may be acceptable if installed properly, Class A provides the greatest degree of fire resistance. When planning new construction or retrofitting your home, check labeling and use a material that complies with UL 723 or ASTM E84. Use Class A or B rated roofing materials. Class A materials are able to withstand severe exposure to fire. Class B materials are able to withstand light exposure to fire and must be installed properly as part of a roofing assembly. Wood shake roofs are not rated and in many cases offer almost certain ignition of your home. Special areas of concern for all roofs are where the vertical combustible surfaces meet the roof line, such as dormers and multiple roof lines as well as valleys where debris may collect. Accumulated litter on the roof is a fuel bed for fire brands and creates an easily ignitable condition for the home. Maintain the integrity of your roof by keeping it clear of combustible litter and repair or replace when required. Trim overhanging trees to more than 10 feet from your roofline to reduce the amount of litter accumulation on your roof and in gutters and to prevent direct ignition should the tree catch fire. Remove debris from the roof surface and gutters regularly. Wind driven embers and radiant heat can be trapped under overhangs. Typical construction materials for eaves, overhangs, and soffits are not fire-resistant and are therefore susceptible to ignition by embers and hot gases. Once an eave, overhang, or soffit has ignited, fire can quickly spread into the roof, into the attic, or through the exterior wall. Soffits normally have vents as part of the attic ventilation system. Unprotected vents can allow embers and hot gases to enter the attic (see Venting below). 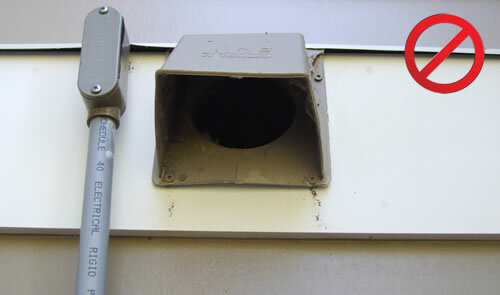 Vents are found in many locations on a home – crawl space, plumbing vents, soffit vents, gable end attic vents, ridge vents, dryer exhaust, or any other opening into your home. Debris can accumulate at vent openings and ignite adjacent building materials during a wildfire. When planning new construction or retrofitting your existing home, check labeling and use a material that complies with UL 723 and ASTM E84. Ensure that all vents have the recommended 1/8 in or smaller steel mesh screening installed to prevent intrusion of fire brands. Fiberglass screening is easily melted by fire and will be easily compromised by radiant heat and fire brands. 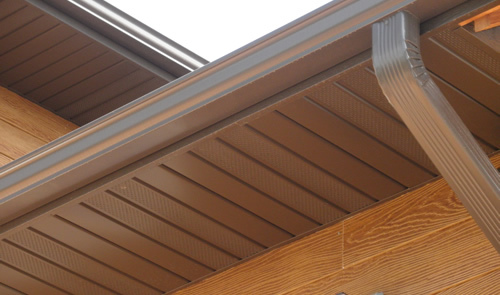 Soffits should be constructed in such a way that the overhang is horizontal from the wall. Soffits that are pitched in line with the roof will excessively trap heat and burning embers. Exterior walls are susceptible to flames, conductive heat, and radiant heat from wildland fires. Fire can easily spread to other combustible components of your home if the siding ignites. Embers can become trapped in cracks in siding, window openings, and door trim and ignite combustible material. Areas where deck or patio surfaces meet the siding or inside corners that collect debris are particularly vulnerable to fire brand ignition. Exposure to the heat of a wildfire can cause window pane failure which will create an opening through which embers can enter your home causing ignition. Vegetation directly below or in front of windows may expose the window to fire and excessive heat if ignited, causing window failure and home ignition. When considering new construction or retrofitting your existing home, check labeling and use a rated material that complies with UL 723 and ASTM E84. Special attention should be given to areas where siding meets a horizontal surface such as deck/patio surfaces or the ground. Keep grass in these areas mowed under 4 inches and clear of any flammable material or debris accumulation. Keep firewood and propane tanks at least 30 feet from your home to prevent home ignition should these catch fire. Maintain at least 10 feet of clear area around firewood piles and propane tanks. Consider burying propane tanks if installing or relocating. For the best protection, ensure that exterior wall coverings are noncombustible or fire-resistant, resist heat and flames, and are not susceptible to melting. For all windows that open, ensure screening is metal mesh that is 1/8 inch or smaller. Fiberglass screening is easily melted by fire and will compromise the integrity of your home. Metal screening will help protect the interior of your home should a window pane fail due to heat. Dual-pane windows provide an additional layer of protection during a wildfire and help protect the interior of your home from fire and radiant heat. The second pane serves as added layer of protection should the first pane fail. Decks are often built at the top of a slope in the direct line of the most likely approach of a wildfire. Embers can become trapped under decks or in the gaps of the surface thereby increasing the risk of ignition and fire spread to the home. Areas under decks are often used for storage which collects combustible debris easily which may be ignited by burning embers. Combustible fencing leading from the landscape to the home provides a direct path for flame impingement on the structure. If the decking surface is repaired or replaced use a Class A fire rated material conforming to ASTME-84 / UL 723. The main structure of the deck can remain wood. Remove all combustible materials such as furniture, cushions, and flower pots from the deck while you are not home during months of high fire probability. Install lattice and 1/8 inch or smaller metal mesh screening to all open areas where flammable pine litter and debris can collect underneath your deck. Keep surface fuels such as brush and grass cut to less than 4 inches within 30ft of your home. Keep all areas where the structure meets the ground clear of combustible debris. Ensure the attachment point of your deck and siding is noncombustible. It can be as simple as installing a row of fiber-cement siding that meets the decking/patio surface. For combustible fences, break the continuous fuel wick by replacing the section of fencing attached to the home with a noncombustible material or attach it to a noncombustible portion of the home. Installation of a metal gate will also break the combustible fuse of a wood fence leading to your home. The shape of the terrain can influence the intensity and spread of wildland fire. Slopes with south or west aspects will become drier and the fuels will cure earlier in the season. Topography alters the normal heat transfer processes and modifies the weather patterns, producing localized weather conditions that can influence fire behavior. Fires starting at the base of slopes become larger and more intense because of availability of up-slope fuels. As slope increases, rate of spread and flame lengths also increase. The topographic configurations of narrow canyons pose dangerous conditions. The fuels on these slopes are also preheated from the sun and may produce more erratic fire behavior. Down slope areas adjacent to structures need to increase the amount of survivable space to provide additional protection to these values from wildfire. We cannot control when or where fire will occur but with proactive planning and preparedness we may be able to lessen the impact it has on life, property, and resources. The goal of Firewise landscaping is to limit the amount of flammable vegetation around your home and increase the moisture in remaining vegetation. Firewise landscaping may not be much different than what may already be around your home. Basic home and yard maintenance items tend to enhance or create fire-resistive features around your home. Plants near your home should be native, well-watered varieties which will inhibit fire spread. Chances are, the plants you already have are on the Firewise plant list or have fire-resistive qualities. More plants can be found on the South Dakota Firewise Plant List. Juniper, cedar, and other plants containing resins, waxes, and oils pose issues near your home. If you have decorative juniper, cedar, or pine bushes near your home, consider removal, pruning, or relocating to an area where they will not impact your home if ignited. When placing mulch around your home, use rock near the foundation and wood mulch farther away. This will provide a fire break between the flammable mulch which is easily ignited by embers and the wall. Plants located close to your home should be well watered and maintained to prevent accumulation of dead debris. The dead leaves and plant material accumulated is a very receptive fuel bed for embers. Grass near your home should be watered and mowed regularly to less than four inches high. Grass farther away than 30 feet may be taller unless on a slope below your home, in which case it should be maintained to less than four inches high. Trees should be spaced to 30 feet between crowns within the first 30 feet from your home. Within zone 2, trees may be spaced in groups of two to three trees with 30 feet between groups. Trees and shrubs should be pruned so lower branches are 6 to 10 feet from the ground. Routinely remove flammable debris such as pine needles, leaves, and branches from your roof. Replace or repair roofing as needed. Keep branches trimmed from within 10 feet of your roofline. Keep the skylight and surrounding area free of pine needles, leaves, and other debris. Ensure screening is intact or spark arrester is working properly. Routinely clear gutters of pine needles and any flammable debris. Replace damaged or broken windows as needed. Maintain screening to prevent ember intrusion into home and to reflect radiant head. During a wildfire, close all your windows and keep them shut to protect the interior of your home. Keep all plants, in boxes or pots, well-watered and maintained. Move empty or dry pots away from your home during high fire probability. Plants soil is very flammable and may even spontaneously combust. Do not allow dead plant material to accumulate in or around planters. Maintain siding as required to maintain the integrity of your home. Keep all areas where the siding meets the ground or decking clear of combustible debris which can be easily ignited by fire brands. If the decking surface is repaired or replaced, use a Class A fire rated material conforming to ASTME-84 or UL 723. The main structural frame can remain wood. Keep surface fuels such as brush and grass cut back at least 30ft from the deck, especially if overhanging a slope. Keep areas where the structure meets the ground clear of combustible debris. Keep the horizontal surface of your deck or patio clear of pine debris and flammable material. Remove plant debris, wood piles, lawn mowers, and other easily ignited materials from under decks. Place combustible patio furniture or cushions inside the house, garage, or storage box during summer months when you are not home. Remove combustible materials from the deck, porch, or patio during months of high fire danger. Keep the area around firewood piles or propane tanks clear of combustible debris. Do not make slash piles near propane tanks. The Firewise demonstration landscape located at the SD Game, Fish, and Parks Outdoor Campus West at 4130 Adventure Trail was created in collaboration between SDGFP, Rapid City Fire, Bureau of Land Management, SD Wildland Fire Division, Great Plains Fire Safe Council, and many local businesses. The purpose of this demonstration landscape is to offer an example of fire-resistant building materials, native fire-resistive plants, and fire-resistive landscaping techniques. Visitors can walk through the landscape year-round and see how various plants, mulches, and building materials look in a fire-resistive system. 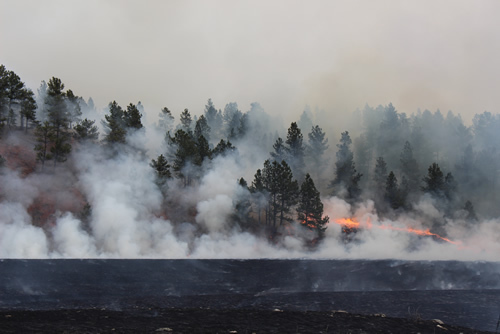 The Firewise demonstration landscape located at Rapid City Fire Department’s Station #5 at 2902 Park Drive was created in collaboration with the Rapid City Fire Department and SD Wildland Fire Division. This site provides example plantings of native, fire-resistive plants as well as fire-resistive landscaping techniques. 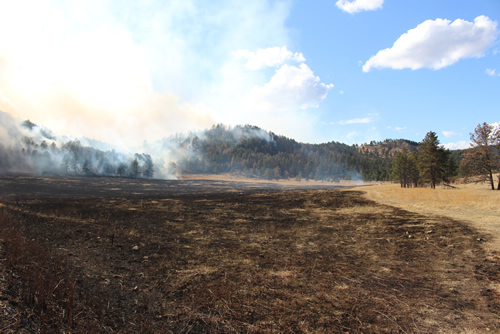 The Firewise demonstration landscape located at the South Dakota Wildland Fire Division. Rapid City Office at 3305 West South Street was created in collaboration with the Great Plains Fire Safe Council and SD Wildland Fire Division. This site provides example plantings of native, fire-resistive plants as well as fire-resistive landscaping techniques. ASTM E84 – American Society for Testing and Materials standard for test of flame spread. E84 is the Standard Test Method for Surface Burning Characteristics of Building Materials which measures flame growth and spread under specified conditions. See UL 723 and Flame Spread Rating. Community At Risk – Communities identified at high risk of damage from wildfire. Published in the Federal Register in 2001, these communities are located within the WUI adjacent to federal lands. Community Wildfire Protection Plan – A document that addresses the needs of the people involved in its development. Issues such as wildfire response, hazard mitigation, community preparedness, and structure protection may be covered topics. Crown Fire – A wildfire that spreads across the tops (crowns) of trees. Ember / Fire Brand – Burning material lofted from a fire and blown ahead of the main flame front. Embers are the primary threat to your home in a wildland fire. Embers can travel over a mile from the fire and retain enough heat to cause ignition. Firewise Construction – The use of materials and systems in the design and construction of a building or structure to safeguard against the spread of fire within the building or structure as well as the spread of fire to other buildings or structures or to adjacent natural areas. Firewise Landscaping – Vegetation placed around a home or other structure in a manner so as to reduce the exposure of the building to an encroaching wildfire, or slow/inhibit the spread of fire from an adjacent wildland area to the building or from the building to the wildland area. Flame Spread Rating – Grouped into five classes, A – E, based on a flame spread index determined in testing. Class A materials have values between 0 and 25; class B materials have values between 26 and 75. See ASTM E84 and UL 723. Fuel Break – Areas where vegetation has been eliminated or modified such that it will not carry fire, typically located around interface areas to reduce approaching wildfire intensity. Home Ignition Zone – The Home Ignition Zone is divided into three zones based on distance from the home. Zone 1 covers 0 to 30 feet and has the strictest requirements to keep fire from reaching the home. 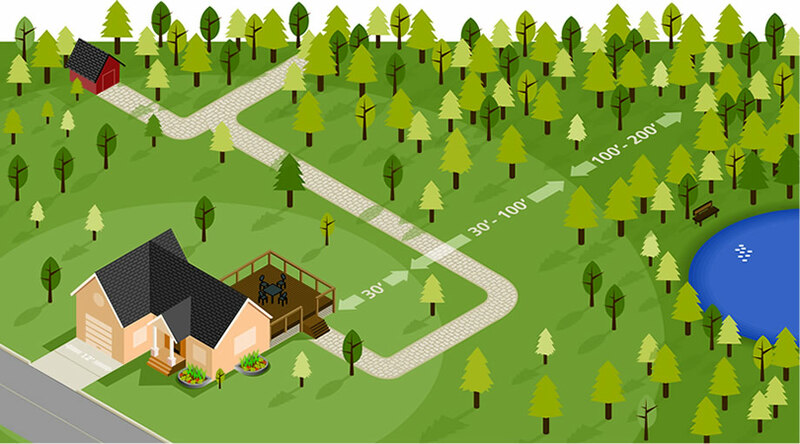 Zone 2 is between 30 and 100 feet and serves as a transition zone to further reduce fire intensity as it approaches the home. Zone 3 is found beyond 100 feet, typically out to 300 feet, and serves to modify fire behavior from a high-intensity crown fire to a more manageable surface fire. Ignition Resistant Building Material – Building materials rated ASTM E84 or UL 723 and identified as Class A or B, with Class A being more fire resistant. Ladder Fuels – Fuels that provide a bridge between fire on the ground, surface fire, and the canopy of trees. If ladder fuel continuity can be broken, fire intensity can be reduced. Prescribed Burning / Prescribed Fires – Carefully controlled fires ignited by land managers to accomplish a variety of objectives such as reducing hazardous accumulations of fuels, improving wildlife habitat, and maintaining healthy ecosystems. Roof Assembly – An assembly of interacting roof components, including the roof deck, Insulation boards and the roof covering. Roof Covering – The exterior roof cover or skin of the roof assembly (shingles, tiles, slate, metal panels, roof membrane). Survivable Space – Space created around a home through vegetation modification to increase the chance of home survival without fire department intervention by slowing fire spread or reducing fire intensity. Typically managed in three zones from 0 to 300 feet out from the structure with varying requirements for each zone to lessen the chance of home ignition. See Home Ignition Zone. UL 723 – Underwriters Laboratories Test for Surface Burning Characteristics of Building Materials. Similar to ASTM E83, the test compares burning characteristics of materials. See ASTM E84 and Flame Spread Rating. Wildland Urban Interface - WUI is commonly described as the zone where structures and other human development meet and intermingle with undeveloped wildland or vegetative fuels. This WUI zone poses tremendous risks to life, property and infrastructure in associated communities and is one of the most dangerous and complicated situations firefighters face.